I've seldom, if ever, heard the Beethoven Violin Concerto played with a chamber orchestra, rather than with a full symphony orchestra. Either ensemble is appropriate, as the work stands right at the crossroads between the spare elegance of the classical period and the big drama of the Romantic period. 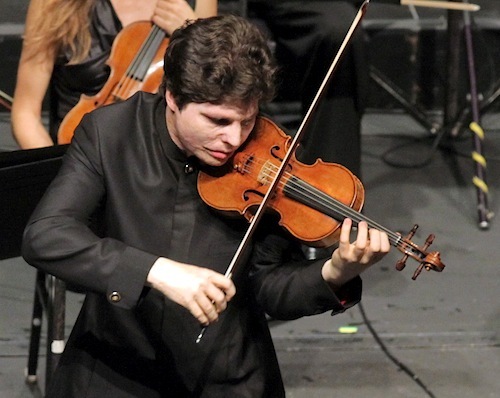 But a chamber orchestra has its advantages, and this was on obvious display Sunday night as violinist Augustin Hadelich teamed up with the Los Angeles Chamber Orchestra and conductor Jeffrey Kahane for a breathtaking performance of the Beethoven at UCLA's opulent Royce Hall. Nimble and energetic, the musicians of LACO played the long introduction to the Beethoven Violin Concerto with so much taste and confidence, I began to forget that we were waiting for a solo violin entrance! But not for long: I could only sit still and feel the goosebumps rise on my skin when Hadelich played the opening: those ascending octaves that melt into a pure line of melody. It was impeccable; he seemed to hold the entire audience in suspense, judging from the quality of the silence in the hall. I don't know if it was a testament to Hadelich or to LACO that, on this night, I could hear absolutely every note the Hadelich played on his 1723 ex-'Keisewetter' Strad. Whether it was meant as melody or as accompaniment, the solo violin sound popped out with just the right balance. Though Augustin clearly was the soloist, he seemed in this context to be part of a chamber orchestra rather than a single voice against an orchestra as backdrop. It was such a smooth partnership. The Beethoven Violin Concerto is one of the most pure and beautiful pieces written for violin, yet the first movement is built on a whole lot of scales and arpeggios. How does one reconcile "scales" and "beauty"? Not a problem for Hadelich, whose scales were gestures with inevitable direction. A chromatic scale floated upward with the grace of a balloon released into the air, as though he were playing without having to use fingers. His energy never produced an ugly sound -- he played the cadenza with no crunch in his chords, yet still with decisive energy. In the simple melody that followed the first movement cadenza, he seemed to use pure sound to arrest all the molecules in the room. I'd never really noticed the playfulness of the second movement -- a little game in which the orchestra makes a statement and the violinist responds with a little show-offy answer. He set up a convincing feeling of improvisation -- a real trick in a piece that's been around for more than 200 years! I had no sense that either audience or orchestra had to be awakened after the slow movement for the outburst of the third movement. I suspect that Hadelich was joyriding on the fast car that is LACO -- he took the final movement at a very speedy clip, which was both effective and exciting. His apparent enjoyment was infectious -- it felt like he was inspiring his colleagues in the orchestra, and they were inspiring him in return. As in the rest of Hadelich's performance, every single note popped out -- all 1,000 kazillion of them! It was so playful it seemed like a scherzo. In the final movement's cadenza -- the Kreisler cadenza, played as fast as I've ever heard it -- the notes were so specific, I felt as though I had put on glasses and was finally seeing all the detail in something I'd viewed many times. It was so impeccably accurate, I was just beside myself. Within a few seconds of finishing, Hadelich had a standing ovation from the audience of 1,253. He played an encore -- the 24th Caprice by Paganini, not exactly an easy-breather, after the exertion of the Beethoven! And yes, he threw it down: the quadruple stops, the left-hand pizzicato, the crazy-high superfast notes, the tenth runs, etc. etc. But more than that, he played it so musically and fluently -- so inevitable, the way the notes fell in his fingers. I've gone on quite a bit about Augustin, deservedly. But I must mention the fact that this entire concert by the Los Angeles Chamber Orchestra was well-rounded, enjoyable and thought-provoking. The first half included the Ravel Piano Concerto in G major, played by conductor Jeffrey Kahane, and two new pieces, "The Great Swiftness" by the Andrew Norman, and "True South" by James Matheson. Both composers attended the performance. Jeffrey Kahane conducted from the piano, which faced the audience and afforded a nice view Kahane's hands as he played. Ravel's Piano Concerto in G was written in 1929, just a few years after Gershwin wrote his Piano Concerto in F, and one can certainly hear the influence of jazz -- perhaps the direct influence of Gershwin -- in this piece. Kahane was such a dynamo, deftly handling both the demands of the piano part and cuing tempos for an attentive orchestra. The second movement begins with a gentle melody in the piano, with a simple lefthand accompaniment, which was so perfectly calculated in Kahane's hands. A little dissonance sneaks in later, after which the movement gravitates toward a lush and consonant kind of piano playing reminiscent of Rachmaninoff. The galloping third movement was percussive and busy, and at this point Ravel reminded me of Ravel, and no one else. This is a perpetual motion movement, like the last movement of Ravel's violin sonata. Its unrelenting speed obscures, the sound becomes a wash of color. So well played. "The Great Swiftness," a piece by Andrew Norman, was inspired by the public art statue called La Grande Vitesse in Grand Rapids, Mich. (A picture of this statue would have made a nice addition to the program notes…!) Kahane said it best, talking about the piece with the composer before the performance: "It was amazing, how you translated the gesture of the sculpture into the gesture of the piece." The piece started with a fanfare in the winds, which became an echo in the strings, with gestures speeding up and thus shrinking, then expanding, slowing to a single note and ringing out again. I liked its clarity of ideas and restraint. "True South," by James Matheson, was inspired by Antarctica, a place that attracts perpetual wanderers and people who live at the periphery, as explained in the program notes. The piece begins with a driving, syncopated pattern in the strings and included many special effects, even a steel drum! Next week Augustin will be performing Lalo's "Symphony Espagnole" with the New York Philharmonic at Avery Fischer Hall (Oct. 18, 19, 20, 23), after which he goes to Houston to play Bartok's Concerto No. 2 with the Houston Symphony. Don't miss hearing him live if you possibly can! The rest of his schedule is on his website. Another note: On Saturday I spoke with Augustin about Beethoven and other violin-related things, and so I will post that interview sometime in the next week. I saw him play the Beethoven with the Colorado Symphony a season or two ago, and it was the first time the concerto truly made sense to me, and that I really connected with it. It's still my top experience as an audience member in a classical performance. I was in the second row, which was sweet, as the acoustics in that concert hall tend to not be so great. In fact, I can't figure out why the cheap seats are usually up front.